1758 On October 16th Noah was born, the fourth child of Noah Sr. and Mercy Webster. 1772 At age 14 Noah was taught by the local minister to prepare him for college. 1774 At age 16 Noah went to Yale University in New Haven. 1775 Noah saw George Washington (Commander in Chief of the Army) as he passed through New Haven on his way to Boston. Yale students serenaded Washington. Noah played the flute. 1777 Noah, his brothers and father tried to join the Battle of Saratoga in New York but by the time they got there, the battle had been won by the American troops. 1778 Noah graduated from Yale and wanted to study law but his father couldn’t pay for it. 1779 After teaching in Glastonbury, he began teaching in the West District of Hartford (what we now know as West Hartford) and lived in his childhood home. 1780 Noah moved to Litchfield, CT to study law. He opened a school in Sharon, CT.
1783-85 Published the “Blue-Backed Speller” and opened a law office in Hartford, but spent most of his time getting his “Speller” published and working on copyright legislation. 1785-86 Lectured. Visited states to get support for his textbooks and for copyright legislation and moved to Philadelphia. Moved to New York City and founded “The American Magazine, “featuring essays on the new Constitution, history, education, and good morals. Published Dissertations on the English Language. Married Rebecca Greenleaf and moved back to Hartford, CT.
1789 Rebecca met the Webster family in West Hartford. 1793 Moved back to New York City. Began publication of “The American Minerva” ( a Federalist Party newspaper) and the semi-weekly “Herald.” Daughter, Julia was born. 1794 Noah’s mother, Mercy, died at age 67 and is buried in West Hartford’s Center Cemetery. 1797 Daughter, Harriet was born. 1798 Noah and Rebecca’s family moved to New Haven. Noah served in the state legislature. 1799 Daughter, Mary was born. 1800 Publishes A Brief History of Epidemic and Pestilential Diseases. 1801 First son, William was born. 1803 Daughter, Eliza was born. 1806 Son, Henry was born. Publishes A Compendious Dictionary of the English Language. 1808 Daughter, Louisa (mentally challenged) was born in 1808. 1812 Moved to Amherst, Massachusetts; served in the state legislature, and helped found Amherst College. 1813 Noah’s father, Noah Sr. died and was buried next to his wife in West Hartford’s Center Cemetery. 1822 Moved to New Haven and got his LL.D (Doctor of Law degree) from Yale University; he traveled to France and England to research the dictionary. 1828 Published An American Dictionary of the English Language. He visited Washington, D.C to further copyright legislation, addressed the House of Representatives and dined with President Andrew Jackson. 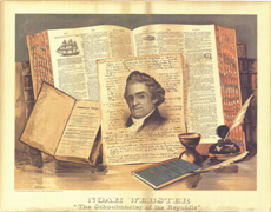 1843 Noah Webster died on May 28th at age 86. He is buried in the Grove Street Cemetery in New Haven with his wife, Rebecca.